CHICAGO and NEW YORK , April 17, 2018 /PRNewswire/ -- Grubhub (NYSE: GRUB), the nation's leading online and mobile food-ordering company, today announced the availability of Venmo as a payment option for their diners. 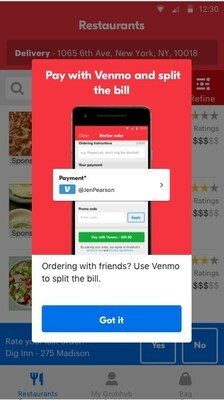 Diners purchasing food on Grubhub, Seamless, or Eat24 mobile apps can now pay with their Venmo balance, linked bank account or debit card. Once the order is placed, diners can split the bill with Venmo, making it easier than ever to share the costs of group food orders with friends. 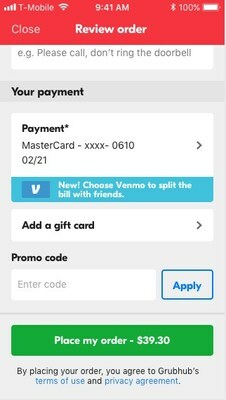 This functionality is available to anyone who has the Venmo app installed on their mobile device and will automatically show up in their available payment options at checkout. "More than sixty percent of our orders are placed on mobile devices, so we always look for ways to make it easier for diners to find, order and pay for the food they want, when and where they want it," said Sam Hall, chief product officer, Grubhub. "We're thrilled to bring Venmo as a payment to our diners, offering another popular and trusted way to pay for meals. Adding the 'split the bill' feature provides an additional level of convenience our diners have come to expect from us." "Venmo was founded to provide people with an easier way to make and share payments with friends and family," said Mike Vaughan, Chief Operating Officer, Venmo. "We're excited to further our longstanding partnership with Grubhub through this integration and given so many food-related payments occur on Venmo each day, it brings the social payment experience our customers love to the mobile buying experiences we know they already enjoy." Grubhub (NYSE: GRUB) is the nation's leading online and mobile takeout food-ordering marketplace with the largest and most comprehensive network of restaurant partners, as well as the largest diner base. Dedicated to connecting diners with the food they love from their favorite local restaurants, Grubhub strives to elevate food ordering through innovative restaurant technology, easy-to-use platforms and an improved delivery experience. Grubhub is proud to work with more than 80,000 restaurant partners in over 1,600 U.S. cities and London. The Grubhub portfolio of brands includes Grubhub, Seamless, Eat24, AllMenus and MenuPages.